Our hectic schedules have prevented us from holding our weekly Trivia game for some time, but we've decided to hold a special Game 4 from now until our Fifth Birthday. TC will moderate and release a new set of questions each Monday. Much like Doggie Fizzle Televizzle, if this six episode run works out the series may return in the fall. As a lead-up to the CIC's fifth birthday, the CIC is hosting a special 6 week Trivia Game 4. The final week will be scored during the CIC's birthday celebration, and the winner will be awarded a special, as yet undecided, prize. 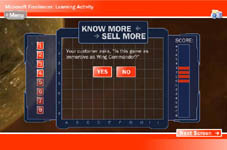 Every Monday two main questions and one bonus question are posted to alt.games.wing-commander and listed at the CIC. Please email answers to trivia@wcnews.com. Be sure to include a name you would like to be known under for the Scoreboard. Have your answers in before this coming Sunday (July 6, 2003) to ensure your answers are recorded. Answers submitted early may be returned and you may be able to fix incorrect answers, time permitting. Main questions answered correctly are good for 5 points, bonuses good for 3. Question 1: Who wrote, "I have heard your accusations and prejudices, and I feel the abrasion of your hate as if you had seared my flesh with a hot light-spear?" Question 2: Who said, "This baby packs a helluva punch. You can take out a capital ship, a building, maybe an entire installation, with this thing. And what's really incredible ... it does it from the inside out. Sounds crazy, don't it?" Bonus 1: Who wrote, "How kan a kat drive a spaceship? They dont have fingers to move the sterin stik." You can email the answers to trivia@wcnews.com or fill out the form here. Submissions are due by July 6, 2003. Which EA Franchise Should Be Revived? GameStar.de is conducting a poll to see which EA franchise viewers think should be revived. The nominees are Wing Commander, Lands of Lore, Dungeon Keeper, Ultima and Bard's Tale. Wing Commander is narrowly beating Dungeon Keeper with 35% of the vote. Head on over and make sure the right game wins! For those that don't speak German, apparently "abschicken" logs your vote. This was originally noticed by the German Wing Commander hub WingCenter. We're fed up with IRC servers breaking.. first DALnet, then Craplink. So we decided to do something about it. We are happy to announce that the CIC's server is now an IRC server! Not only is it a home for the CIC's own channel, #WingNut, but it is a community server. Need a place for your fan project crew or Crius.net friends to meet and discuss things in real time? Just connect, join the channel that you want, and talk to ChanServ about registering it in your name. 1. If you have a fairly recent IRC client installed, click here and hopefully you'll find yourself in #WingNut within moments. 3. No IRC client handy? Use our JavaClient! Just click here and our Java client will drop you in #WingNut. Problems? Let us know and we'll try to help. Don't forget to include details of any error message that you get and what IRC client you are using. Enjoy this new CIC feature, and feel free to register your nicks and set up your own channels through NickServ and ChanServ. The WC Saga mod is coming right along. Up next they need people to record speech for them. I'll let Tolwyn give you the update. Considering the fact that we are close to release of volume 1 (5 of 12 missions are in the beta phase, there is a possibility that there will be two campaigns included), it is really important that we can fill gaps in the production. We're still in need of voice actors, so if you have a clean sounding microphone and a good voice send us an email (Tolwyn@gmxpro.net). The roles we are wide spread from minor to main roles, so it shouldn't be too much trouble even for those who don't have a lot of time to dedicate to this. If we find enough voice actors, the game will be released in two, three months. Get in touch with them if you can help. You can ask questions at Crius here as well. The CIC staff is busy with a handful of Wing Commander projects this weekend, so that's that! 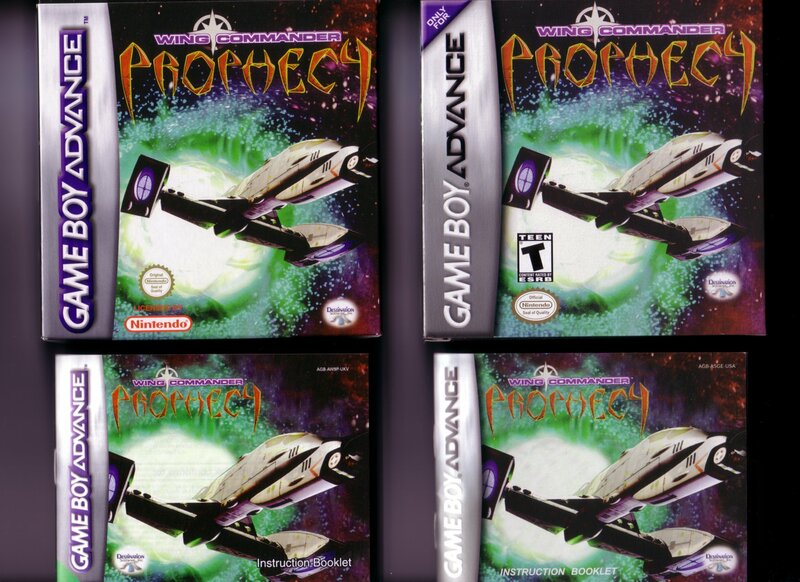 The previous reports have proven true: Prophecy GBA is out in the UK. We haven't heard of it being available in other countries at this time and Take 2 Germany is quoting a July 11 release date, so perhaps the rest of Europe won't follow until that date. Read on for a comparison of the European version. 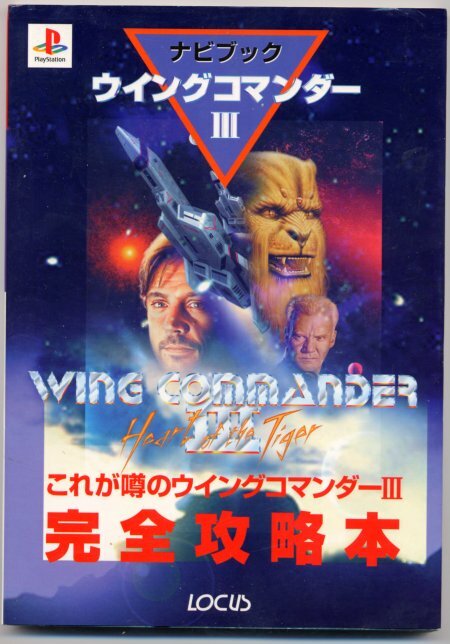 It felt really great to be able to walk in to a store and buy a Wing Commander product. 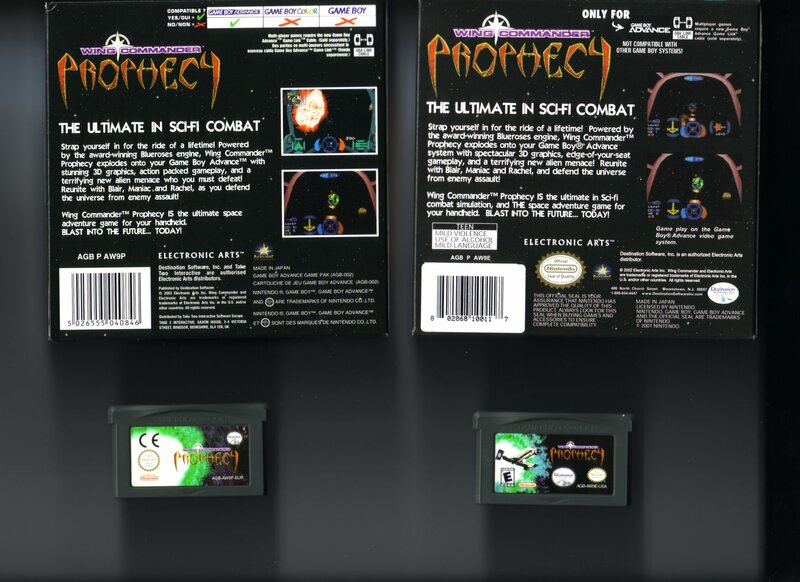 Today I picked up a copy of the UK release of Prophecy GBA. Naturally the first thing I did was find out how it differed from the US version. The answer is: not much. The box is virtually identical. It does get a different pair of screenshots and a few logos changed or moved around. The manual has a different font and the pages don't have a background image. The text is identical except for one thing - more credits. 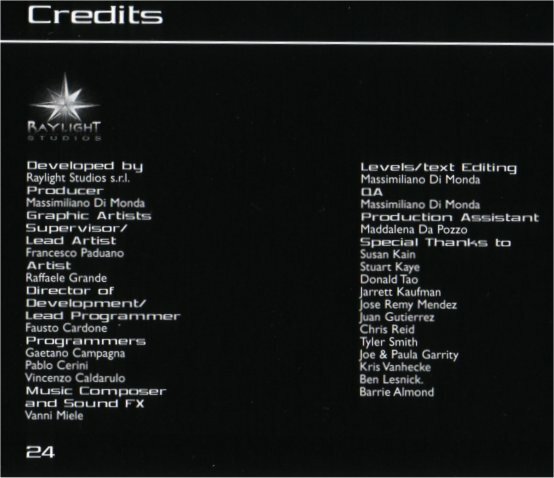 It lists the Take 2 people responsible for putting the game out and it lists the full Special Thanks list from the game. Well that change makes the CIC staff happy at least. The game cartridge is a little different too - the ESRB rating has disappeared.. and so has the Vampire! We're currently assuming that both have travelled through the jump point. The game itself plays exactly the same, but you can select the game language from a menu when you first turn the game on. Languages available are: English, Italian, French, Spanish, and German. Here, have some scans. 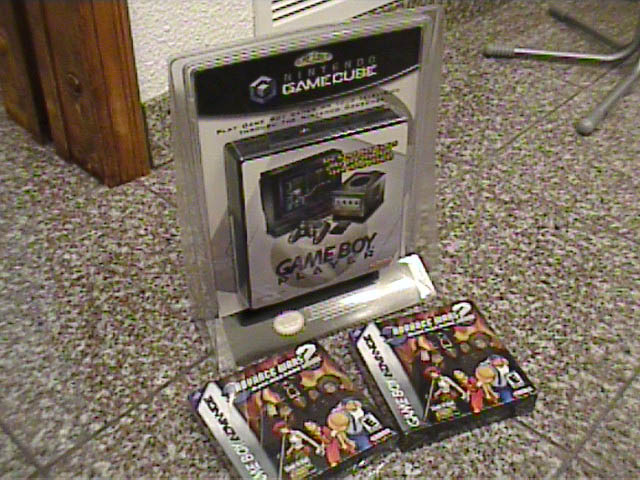 They are from left to right: Front of the box and manual (UK version left, US version right), Back of the box and the game cartridge (UK version left, US version right), really bad picture of the language select screen taken by shoving a Gameboy in a scanner, and a sample page from the UK manual. The screen will flash white quickly to let you know that it worked. Then just go to the Midway's rec room and access the tactical database as usual. Stay tuned for a couple of cheats which we'll release somewhen over the next six weeks. We're holding those a bit longer since the game has only just been released in some areas and we'd like to give people a chance to play through properly first. Up first for today we've got a fan art submission by Rob Roberts. It's a little wonky, so I'll let him describe it. I'm a WC fan who just stumbled across your site. I made this pic in Paintbrush (hard-core), influenced by WC. Not featuring any neccessarily identifiable ships, the style is similar. I see some sort of Kilrathi manual in there, though my take is that it looks like Hobbes in a Ferret. 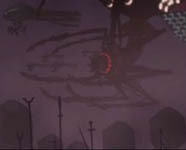 It could be a fighter in the background.. though it looks a bunch like a Gilgamesh Destroyer. You can actually find more of his artwork here. Stay tuned, Hades should have some extra cool stuff later today. Stephen from BttF.com sent us the details on a big site relaunch for TomWilsonUSA.com. Of particular note, there are two quicktime movies available for download that were originally included in the Wing Commander 4 Press Kit. To view the movies, load up the site and click on Video Clips. The first two are embedded QuickTime videos. The first is 3.5 megs and the second 3.0 megs. They're both funny little mini interviews with Wilson in uniform on the set of Wing Commander 4. The Polls have changed, though not very much this time. As a continuation of our last poll, we're now asking how you rate Prophecy Advance. We know from our last results that a number of people don't have the game yet, but those that us how they feel. You can find our old polls here. GAME UK is now reporting that they have stock of Prophecy GBA. This is a little early since the official release date quoted by numerous other sites seems to be tomorrow, but it's a great sign after a couple of months of delays. Hopefully other European countries will release tomorrow, and possibly also Australia since their release is also being handled by Take 2. 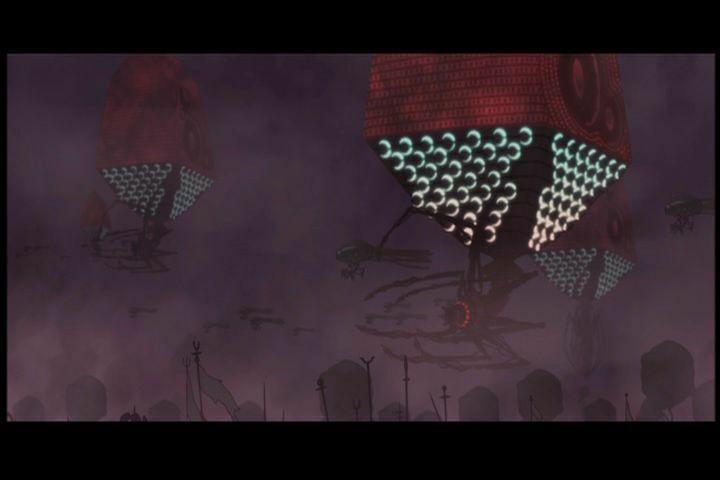 HotT sent us another shot from the Animatrix. 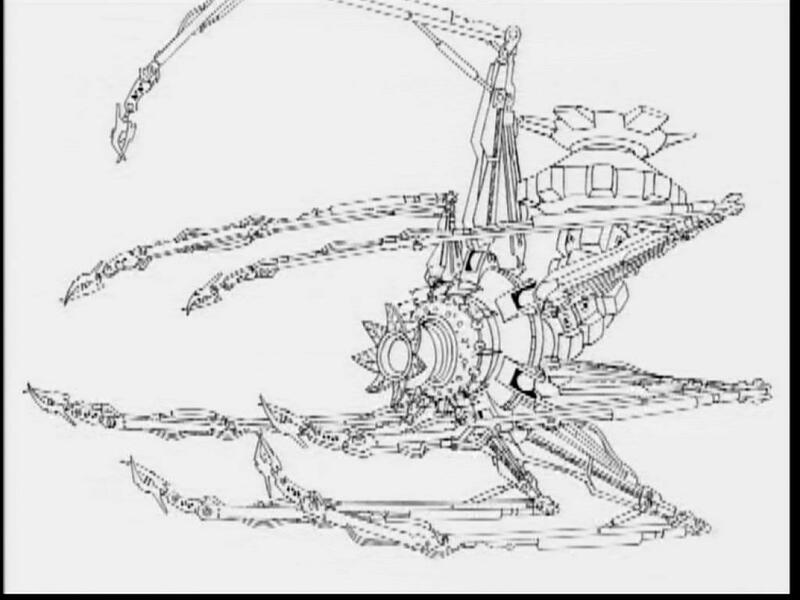 People are saying this robot thingy looks a lot like a Nephilim Tiamat. You can compare shots from our earlier update here. I do agree there's quite a darn lot of resemblance there. Alrighty, we've got a good idea of what to order for our new CIC polo shirts. Let me know if you're interested and haven't contacted us yet. We'll probably do formal orders in about a month. You can make comments here. Here's a rundown of the basics again. In a matter of hours I'll be driving to work to meet a hundred rabid Star Wars fans with one thing on their mind, and it's not Natalie Portman. Star Wars Galaxies, the giant massively multiplayer game, arrives in stores today. 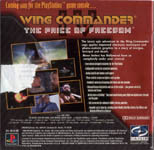 Quite a few Wing Commander and Origin affiliated people were involved in its production, ranging from designer Captain Johnny to producer Rich Vogel. You can find Letters to the Community from some of them here. That's J Allen Brack holding the Chris Roberts sign there. Let me know if I missed someone! I didn't see a letter from Anthony Sommers and a couple others I thought were involved at some point. Don't They Have a Patch For That? Captain Johnny, ruler of all mortals, is selling patches! 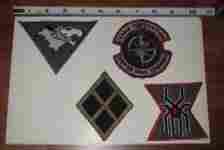 Two sets of patches, to be exact. 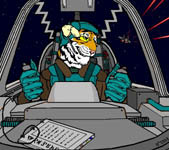 Bid away your hard-earned cubits on a Wing Commander IV set and a Wing Commander Prophecy set! That's like... four plus four... a million patches! 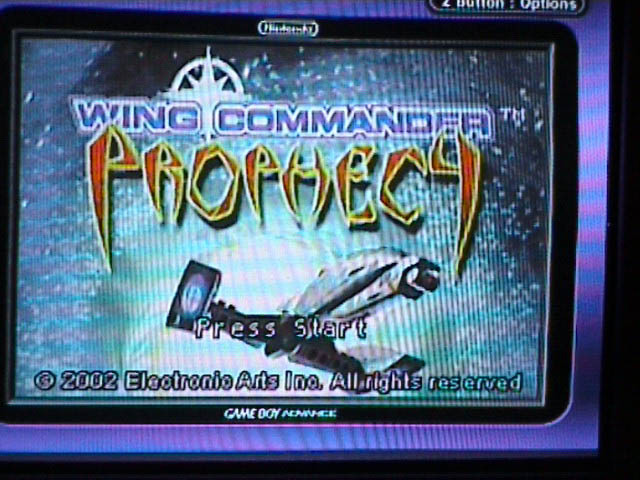 I've had a chance to give Prophecy Advance a good test drive on TV via my GameCube with the new Game Boy Player. I'm liking it a lot so far. For starters the game is both upped in resolution and anti-aliased to prevent pixelation and jagged edges. This produces a very nice image even in full screen on your television. Playing with a GameCube Controller or wireless Wavebird is great. The ability to pilot with the analog stick and drop decoys with a comfortably placed thumb button are helpful. Afterburners seem easier to engage and control with the triggers, though some button combinations will take some new getting used to. 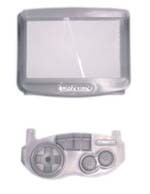 Although you lose the portability by using this device, multiplayer on four big screens is a pretty neat proposition. I was having quite a bit of difficulty getting good photograph quality of the TV, but it does look quite nice. BramCN/Julian have suggested the VDM Sound utility as a potential way to work out some sound card incompatibilities under the newest versions of Windows. The program simulates a DOS environment and emulates a Sound Blaster for your older games. This has the potential to clear up a wide variety of sound conflicts on modern systems. You can find the program here or read Julian's helpful tutorial here. EA Breathing Life Back into Origin? Hopefully that headline catches your attention. At the CIC we're concerned every day with the continued prosperity of Wing Commander and the community. We're always very keen to foster any potential for new games on the computer since that's where it all started. This year's Prophecy Advance was a tremendous bonus for Wing Commander fans, but as great as it was, it also left many wanting more. Today's another day where we see events begin to unfold that could mean profound changes for us in the future. Without trying to get too wordy and deep into history, PC WC games were going extremely strong through 1998 with the release of Secret Ops. Multiple WC projects were on the table after Prophecy, and SO was merely a bonus to hold over fans until the next iteration of the series. However from 1998 through 2000, a series of changes occurred that resulted in the cancellation, uncancellation and recancellation of different WC games. The resulting chaos ended up with Origin existing solely to run Ultima Online. This began a period of stagnation that had persisted until recently. The newest Ultima Online addons appear to have been successful, and we reported last week that a new chapter in the Ultima franchise may be in development. GameSpot has shed new light on this. Apparently EA is bringing veteran producer Andy Hollis out of retirement to guide this new endeavor. What's the significance there? 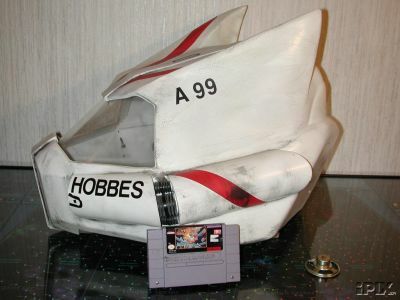 Hollis is known as one of the gaming gods of combat flight simulators. He was a big force at Origin in the past creating the Jane's line of military flight sims. And it's a little known fact that one of his last jobs at Origin was supervising the production of a now-cancelled Wing Commander Online after leading the Maverick Team at OSI. What does this mean today? All information that is publicly available points to him merely working with the Ultima franchise right now. The importance of that statement cannot be understated however. The Ultima series runs extremely parallel to Wing Commander in terms of history and production, and if EA can revive Ultima with a snap of its fingers, Wing Commander is no different. If EA wanted this to happen, Andy Hollis would be one of the people who'd be able to take the reigns and do it. I'm always hesitant to put false hopes out in people's minds, but I am a genuinely optimistic person. This could be a point where Origin becomes really active again. We're doing what we can on our end now. Hopefully in the coming days, weeks and months we'll have more developments to share. For more information, check out the GameSpot article here. Andy Hollis, the veteran designer responsible for many MicroProse and Jane's flight sims, is recruited to head EA's Austin studio and oversee the Ultima franchise's next steps. When we recently heard that Andy Hollis had joined EA's Origin studio in Austin, Texas, as chief operating officer and executive producer, we had to wonder if the Austin studio would turn back the clock to the heady days of the Wing Commander series, Privateer, and Strike Commander and do a new combat flight sim. 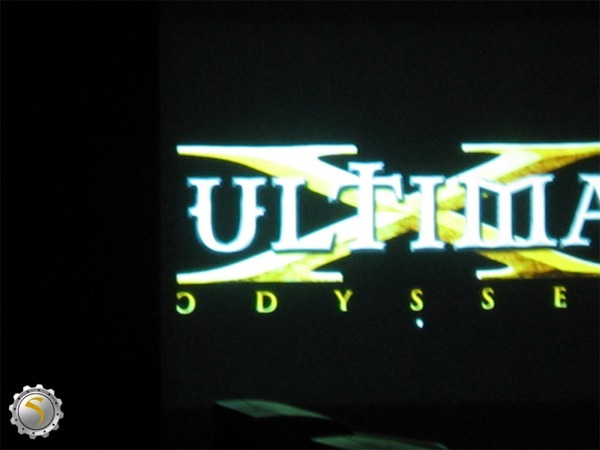 Asking about the Ultima game that's been rumored to be in development since the appearance of a leaked "Ultima X: Odyssey" title screen image, we received a unison response of "No comment." Hollis reiterated that Origin isn't going to work on anything that competes with Ultima Online. Yet other comments hinted that other teams are working at Origin, in addition to the 15 to 20 people dedicated to Ultima Online. The CIC's LOAF chats with Andy Hollis during a trip to Origin way back in 1998. 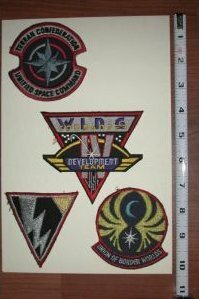 Wing Commander Standoff, one of the bigger Secret Ops mods in the works, has recently posted several advances in the project. Here's the latest. Today I've finished the TCS Lexington! There are three screenshots of it on the screenshots page, and its stats are available on the ships page. Also, there is now some info on the player character, Captain William Bradshaw, on the characters page. Head over there and get used to your new face. There have actually been multiple updates recently that we have not reported on. You can find recently added pictures of a Krant, Jalthi, Clydesdale and more here. Keep in mind that these are all done in the Secret Ops vision engine. WC modders are doing neat things these days! Vega Strike is one of those WC mods that has been around for quite a few years and has gotten a lot of attention outside the WC community. Hellcat's got another update for us, so I'll leave it to him for the news. I just released the last release with the old dataset (a new dataset with professionally done art by Howard Day is already finalized, just needs playbalancing). We're using this release to test the logic within the dynamic universe. The way Vega Strike works now is that every ship is tracked... every battle is simulated behind the scenes---and eventually systems fall, and empires crumble--or succeed. Of course in game you're just a pilot, accepting missions of the relevent factions to attack the relevant flightgroups. Each ship has a name, so you can run into ships many times and remember where they like to cause trouble. Plus PeteyG has added specular mapping to all the ships in the old dataset--and a new Nova that looks a lot more like the best fighter in WC. Download the new release (windows, mac, linux) and post to the forum about how you like it and how the dynamic universe works out. Bob is still working hard to mod Freelancer to give it a much more Wing Commanderific feel. He's got a lot of the technical issues handled, but now needs people with a good grasp of Wing Commander humor to stock the universe with conversational banter. Now that most of the ships and equipment are in place, the next logical step for this mod is to add dialogue and newsbriefs to give the universe more of a "Wing Commander feel". I decided long ago that it would probably be futile to recreate the WC universe in any significant portion in Freelancer, so the focus here is on WC-izing the existing Freelancer universe. You can try your hand at helping out the project here. WC Saga's board has moved to Crius.net. You can discuss the project here, along with Unknown Enemy, Standoff and others. WC Saga has looked into a variety of game modding over the years, with a lot of attention to Freespace 2. With all the recent completions and successes of the modding community, they all have quite a bit of momentum to help them do bigger and better things in the near future. Today Nintendo's GameCube Game Boy Player is released in the US. I can't wait to play Prophecy Advance multiplayer on four TVs with full-scene anti-aliasing to smooth out the picture. Just being able to switch to the almighty Wavebird wireless controller will be great. Hopefully we can set this up at Dragon*Con. I'll have some detailed impressions later today or tomorrow. 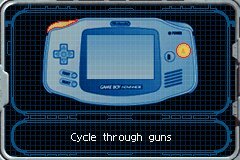 In rather abstractly related news, Advance Wars 2 ships today for the GBA. GameSpot also recently reported that Digital Anvil's Brute Force is making new sales records! Congratulations DA! Microsoft has announced that Brute Force has become the fast selling game in the Xbox library to date, beating out even Halo in its first week of sales. It also had the largest first day sell-through (copies of the game actually being sold at the stores as opposed to just being shipped) of any Xbox game at the retail outlet known as GameStop. After doing battle with our new server, SolSector.net is once again open for business! All site owners should now be able to update their sites. We did lose a couple of passwords, but those have been changed and sent to the address used when signing up. Most people should now be pointing to the new server, but those who aren't can just FTP in to 205.214.83.106 instead. As usual, if you hit any problems please let us know! This concludes our server move. Let's hope that we don't have to go through this again for a few years. AD was digging around at IMDB and came across the rental revenues area. A lot of people talk about the movie's rental power back in 1999, and these are some actual numbers to deal with. You can see through early October here that the movie took in about a healthy $20 million in the US in rental income. I do recall being pretty happy to see multiple shelves of the title when it first hit Hollywood and Blockbuster. I wish I could have gotten my hands on some of the signage they had all over the place. You can discuss this topic at Crius here. Things are progressing nicely with our server move, though moving several gigs of data and three domains is not a quick task. The main CIC site is now complete and should be fully operational - if you notice any problems (missing files, script errors), please let us know. Crius is working quite nicely with the only Forum issues being layout related. Due to nameserver changes having not fully propagated yet, we are currently unsure if all emails are getting through to @crius.net email addresses so if you have one, it might be a good idea to direct any vital emails elsewhere for a couple of days. We're on schedule with SolSector.net sites too. Files are being put in place right now and we'll be able to set up passwords soon. Full access for uploading to sites should be restored some time tomorrow, again depending on when the nameserver changes take effect and everyone starts getting sent to the new server. Whew. After this we'll need a holiday. Well, it's been a hell of a long road getting to this point. We've published a hundred and sixty chapters to date, sixty-five of them as part of the Loki battle alone. In that time, we've had stories about the Confed and Border Worlds fleet units fighting to hold the line against the Nephilim, the Third Fleet reserves and Union Militia troops that were detailed to reinforce the fleet, the Tanfen merchants who were caught up in the battle against their will, and the many bit players who've added their stories to the campaign. This is where all those threads come together, as the Combined Fleet jumps into Nifelhiem to link up with the reserves, and prepare for the final showdown with the enemy. From here, we're headed straight into the big finale of the battle to hold the line. This chapter is written by yours truly, so please send any and all comments back to me. Pretty soon we'll be ordering a batch of CIC polo shirts to wear at Dragon*Con and other events, and we thought we'd extend the deal to everyone else. Be the first on your block to sport our trendy new line of casual wear. I'm not doing actual orders now, but I do need emails from people who would seriously consider buying one to gauge how big our order should be. They'd be standard black 100% cotton polo shirts, non-pocket, with our multicolored main logo embroidered on the left breast. They'd be approximately $21-24, including shipping. A sample logo is provided below. Send me an email if you'd be interested. You can also comment on the project here. Prophecy Advance Limping to Australia? Quarto and others at Crius have been reporting that Australian game stores have been reporting a June 20 date for Prophecy Advance. Since initial reports are that the game has not actually arrived, it may be that June 20 was a shipping date. If anyone finds a copy or learns more, let us know. Update: Hades pointed out that Australia is being handled by Take2, which ships to Europe June 27. The bulk of our server team's work today will revolve around migrating the primary wcnews.com. Downtime should be minimal, if noticeable at all. With Crius now functional, we'll also be able to keep in touch via http://205.214.83.105 in case the main page is inaccessible. We will also be transferring all solsector.net data over the next day or two. Sol sites will still be available on the old server at http://209.151.83.218, but site owners won't be able to update until the new server is up and running. Where's Your Wing Commander Tattoo? I bet someone thought I was joking yesterday. It's not just a picture of Hades with an Origin logo on his head. 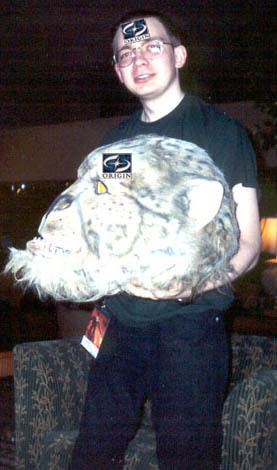 He's also holding a giant Kilrathi head with an Origin logo on it too. At 8:00 pm and 11:00 pm Pacific/Eastern, the Discovery Channel in the US will be airing an XBox Documentary. A certain portion of our viewer base might find that interesting by itself, but JustinS and I might show up because of the after-hours E3 stuff we attended last month. During one of our recent Polls, the XBox won as the console of choice for a theoretical new WC game. It definitely has some big things going for it, so if you'd like to learn more this might be a good opportunity. Kris and Hades have successfully upgraded Crius.net and moved it to the new server. Note that the IP mentioned below has changed. Other things are still in transition over the next day or so. We'll update the progress here. You can find Crius at http://205.214.83.105 now. Over at Crius the other day people were asking about new things added to other console ports of Wing Commander games. 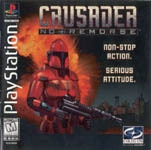 I happened across an Origin Crusader No Remorse with a Wing Commander 4 PSX ad inside. It bullets some of the advantages of the game. WC4 was one of the WC products with quite a marketing budget, so back in 1996 you could find ads for this thing everywhere. I always love to see the Origin logo on stuff too (coming tomorrow, a doctored photo of Cpl_Hades with an Origin logo tattoo on his forehead). 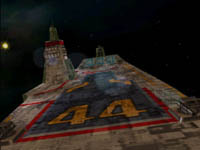 The latest epic adventure in the Wing Commander saga applies improved cinematic techniques and photo-realistic graphics to a story of intrigue, betrayal and death. To better serve the Wing Commander online community, we're moving to a new dedicated server (also, because we are not fans of having money)! There may be some significant downtime during the transfer of domains, so please keep the following IP's on hand if you want to keep up with the latest Wing Commander news (or Services at Crius, or Fan Projects at SolSector or ace-1 stuff at... well, ace-1). Excited about Dragon*Con? I know I am -- but that's because I'm going. You should go, too, though -- it'll be more fun than a barrel of especially fun monkeys (the so-called 'funkeys'). Anyway, we've set up a temporary forum for people planning on attending, so we can arrange travel methods, hotel rooms, uniform sizes and such. You can zone it in here. The zone may be temporarily inaccessible for a short period of time while we upgrade our server. 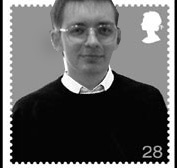 In the lead-up to Cpl_Hades' 21st birthday Britain's Royal Mail has released a set of stamps to celebrate the CIC staff member's coming of age. The stamps, which went on sale Tuesday -- three weeks before Hades' birthday -- feature photographs taken at Dragon*Con last year. We couldn't be happier for him here at the CIC. The new stamp will also be the first to feature the new 28 pence rate. You can read a more in-depth article on this exciting development at CNN here. Advance orders have already been taken from collectors and fans. "We are expecting them to be this year's most popular stamps. Our order lines have been extremely busy," a Royal Mail spokesman told the Press Association. Sentinel Robot or Nephilim Tiamat? 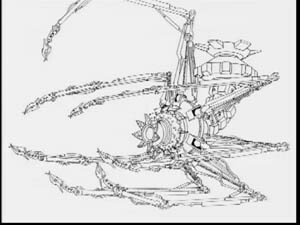 Happy over at Crius.net noticed a striking similarity between one of the ships in the recently released Animatrix DVD and the Tiamat from Prophecy. There is kind of an interesting resemblance there.. If you'd like to contribute your thoughts, registered Crius members can continue the discussion here. TC noticed that IGN has already posted their full review of the device that allows you to play GameBoy games on your TV via your GameCube. More than merely a mod to export signal to your television (which LOAF and I have done), the player module adds a host of new features. Starting next week you'll be able to use a standard GameCube Controller, Wavebird or Joystick to control the Prophecy Advance action. The signal will be resized to tv resolution and LCD flicker will be removed for enhanced picture quality. The game will also be fully anti-aliased. I got a chance to poke one of these things with a Nintendo rep yesterday and they're pretty darn nice. We'll have detailed impressions next week. You can find the full review here or order a GameCube Joystick here. I'd be remiss if I didn't point out that Joe Garrity of the Origin Museum (pictured below) wasn't absolutely essential in not meeting Bill Forstchen. Because he was. So there. Ah, who am I kidding, I just wanted an excuse to show this picture again. Is Freelancer as Immersive as Wing Commander? Today we learned Microsoft has provided a online retailer training module for Freelancer. This is a common practice to help educate retail associates about the products they will be carrying. 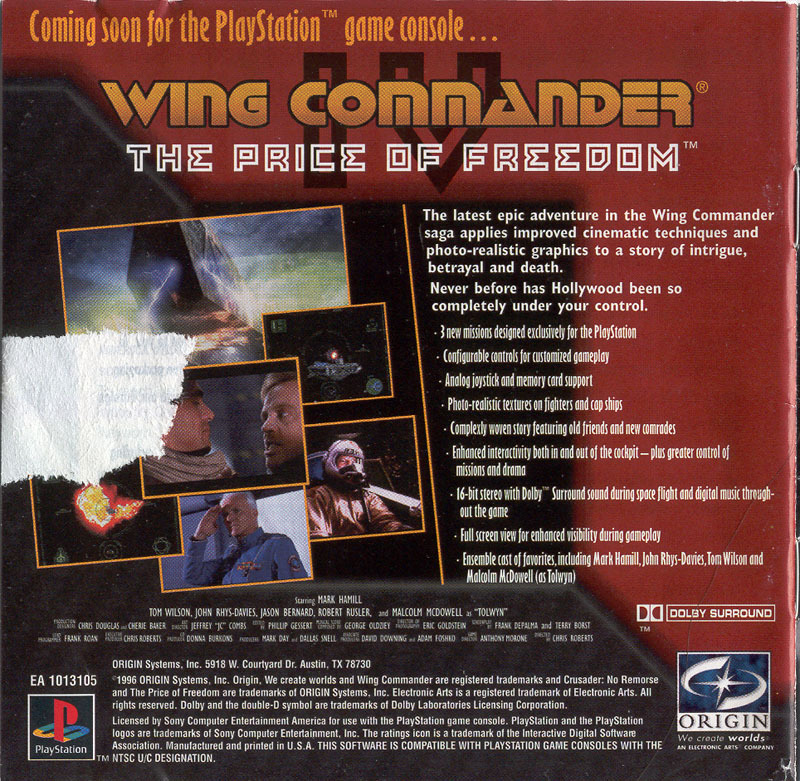 In the case of Freelancer, one of the possible common questions retailers should expect from customers is "Is this game as immersive as Wing Commander?" If the retailer chooses "Yes," they're treated to the text below. Good Answer. You know that the same guy behind the Wing Commander series, Chris Roberts, laid out the narrative and gameplay for Freelancer. IGN's subscription service works on a time release system (as opposed to GameSpot's limited time public availability), so after a certain amount of time their reviews become open to the public. Prophecy Advance just became unrestricted. If you'd like to read the entire review yourself, it's now available here. The review organizer MetaCritic has compiled its Prophecy Advance section and highlighted a brand new review. The new review is from Cheat Code Central Platinum. Apparently you need to pay to access much of the site at all, so what we have is from MetaCritic. Apparently their biggest gripe was the control scheme. They rated it a 6.0. You can find more here. A few people were wondering about the significance of Action Stations and Newt Gingrich in the news yesterday. To answer their questions, we visit #Wingnut. [LOAF] Let me think about it, first I have my Forstchen story. 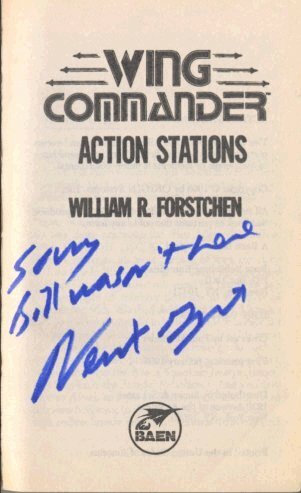 [LOAF] I got Newt to sign Action Stations. [LOAF] So now I have an Action Stations signed "Sorry Bill wasn't there, Newt"
For this and other exciting adventures, drop by #Wingnut today! Solid Eric noticed that GameSpot has posted their official review of Prophecy Advance. After everything balances it comes out similar to IGN's review with a solid 7.4, but it's interesting to note they have opposite opinions on aspects such as sound effects and music. To each their own. As usual, graphics and fun factor receive the highest ratings. Sound brings it down a little. Since GameSpot's subscription service works differently than IGN, you can view the entire review here now. Don't forget that GameSpot is also one of the places where you can rate the game yourself as well. Right now reader reviews give it an average of 8.2 We can easily influence that. It's also worth noting that Prophecy Advance currently is GameSpot's second most popular GBA game right now, beating out Wario Ware, Advance Wars 2, Donkey Kong Country and the new Golden Sun. 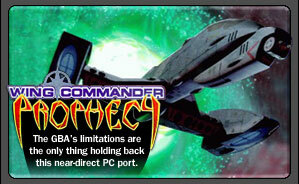 Wing Commander: Prophecy is a triumph on the Game Boy Advance, but it's not without its flaws. Given a bit more time to tweak the controls and further polish the graphics, Destination Software could have had a groundbreaking work on its hands. Instead, Prophecy is just a solid space combat game that will appeal to anyone looking for the likes of Wing Commander or Colony Wars on a handheld. You can find the full review here. You can discuss the review at Crius.net here. I've been seeing lots of Guests lurking at Crius lately, registration is easy. Join the discussions! TC noticed that Amazon shifted their Prophecy Advance price slightly again. It's down to $28.88. This appears to be because they've shifted to J&R Music and Computer World as their supplier. If you navigate the site you can still buy it from TRU for $29.99. In slightly related news, it appears the TRU side of the site was sold out about a week ago. They've gotten more back in. It might have been their first shipment that was discounted to $19.99 and the MSRP price reflects their restock. The day after we report about red and black SP's coming to the US, Japan goes and gets another limited edition color. And it happens to be a combination of red and black in one unit. 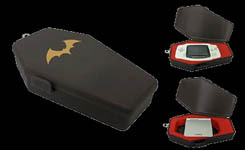 But there's more, it's a special SP designed to launch with the Boktai vampire game by Hideo Kojima. If you haven't heard about it yet, the game has a built in sensor that detects sunlight and uses that to charge your powers and whatnot. It's an interesting item. You can read more about it at GameSpot here. ChanceKell noticed that Wing Commander will be showing on the Sci-Fi Channel in the US tonight at 6:00 PM. Just thought you guys would want to know that the SciFi Channel is playing their slightly edited version of the Wing Commander motion picture at 6:00 PM Eastern tonight (Friday). Since it's in the early evening time slot, it'll probably be the pan and scan version. You can find their schedule here. Ack, for those who've waited too long, it looks like Amazon.com's Prophecy Advance has gone back up to $29.99. At this point the K-Mart $27.99 price point seems to be the cheapest if it's still current. If anyone else finds some legitimate places with cheaper prices let us know. Good thing I already snagged a bunch for the Birthday. EA's Earth & Beyond just held its first fan gathering. UO has had a couple similar Fanfest and Luncheon gatherings, and E&B appears to have reached this important community milestone. The daylong event was held in San Jose, California and featured game oriented discussions, competitions and prizes. Machines were set up to log into the E&B universe and some who could not attend in person were present through the monitors. You can read the full writeup here. 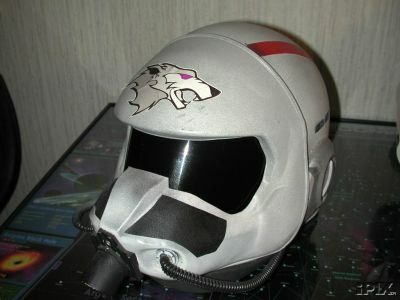 You can read about our own annual Wing Commander Fan Gathering here. Earth & Beyond's First Ever Fan Gathering was held on May 24th, and was a successful event with lots of chats and discussions, prize giveaways, and a surprising amount of logged gameplay. The first attendee arrived onsite at 6am and the last attendees remained far later than the 8pm scheduled ending. E&B fans come from thousands of miles away to sit next to each other and play E&B (left). 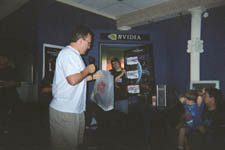 Executive Producer Craig hands out prizes (right). In related massively multiplayer news, UO's price is going up. Although Everquest and the like may have eclipsed it in recent years, UO was the first modern MMORPG, and as such it retained its $9.99 monthly price tag over the years. Since then even less "massive" games have featured prices in the $12.99 monthly range. After the better part of a decade now (seems like yesterday that ace got into the Beta), their pricing structure is changing. By choosing our new 6-month discount package, you can keep your monthly rate at $9.99 per month — maintaining your rate where it is right now! It seems kinda weird to be that excited about keeping the monthly rate the same. I always feel a nostalgic when I see the Origin logo on the box with each UO release. 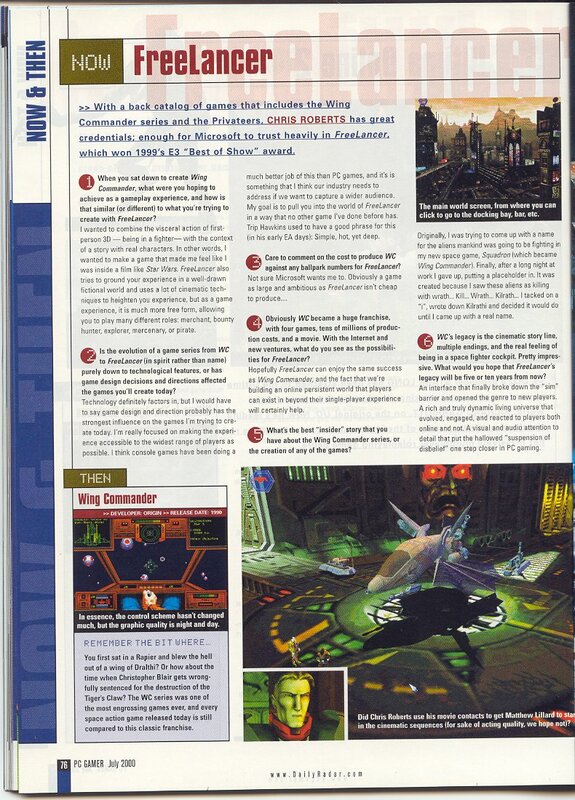 Wing Commander creator Chris Roberts' brother, Erin Roberts, was interviewed for the June 11 GameStop circular. 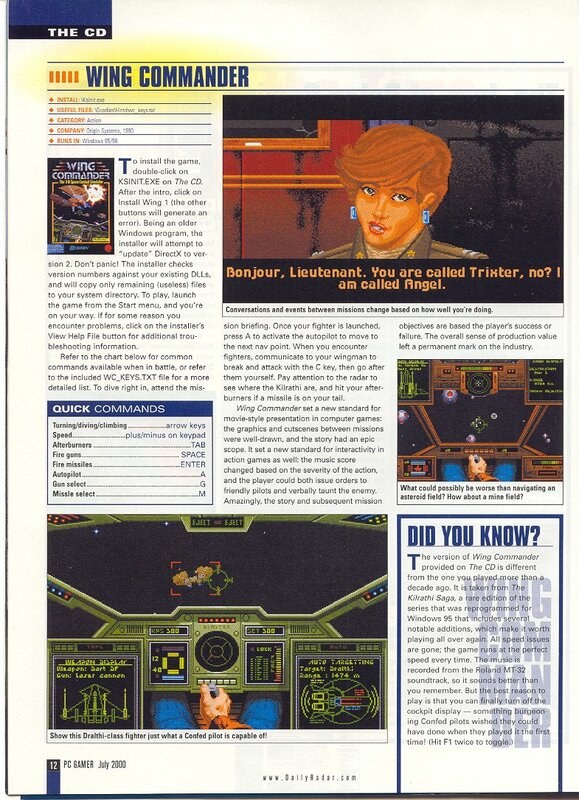 The article focuses on Brute Force, Digital Anvil's latest game, but Erin's bio predominantly focuses on his Wing Commander history. 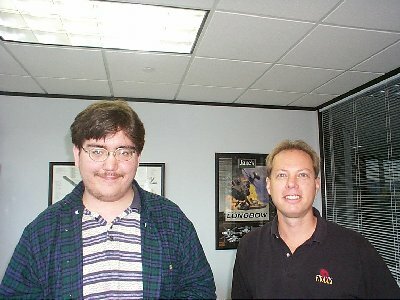 Although Chris often gets a lot of the fame, Erin was actually a major force in Wing Commander and Privateer, and he was the executive producer of Privateer 2. On the subject of Brute Force, I've found it to be quite an enjoyable game. It's probably in my XBox top five, and I'm very anxious to system link up several systems for cooperative multiplayer. 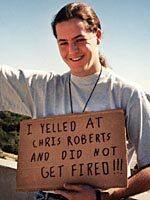 Erin Roberts started his career in 1987 working at Origin Systems in Austin, Texas. 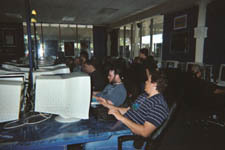 He worked on titles such as Wing Commander, Strike Commander and Privateer. 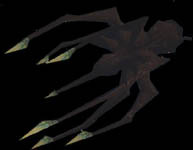 In 1993 Erin transferred to Electronic Arts UK where he prodiced Privateer 2: The Darkening. 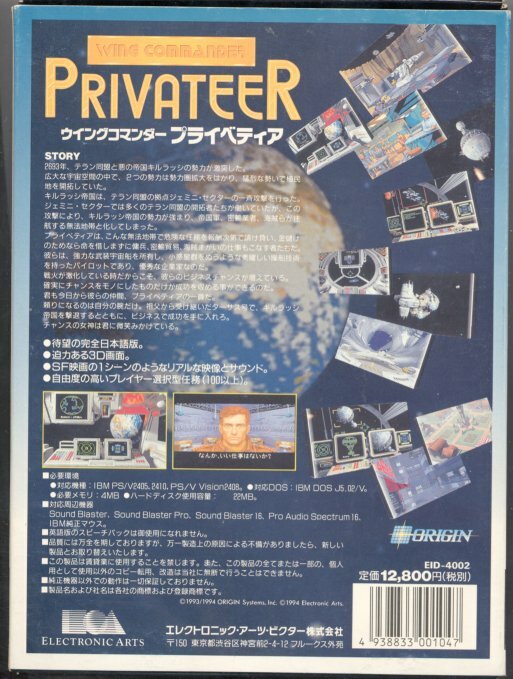 Note that Privateer 1 actually came out in 1993. P2 was a few years later. 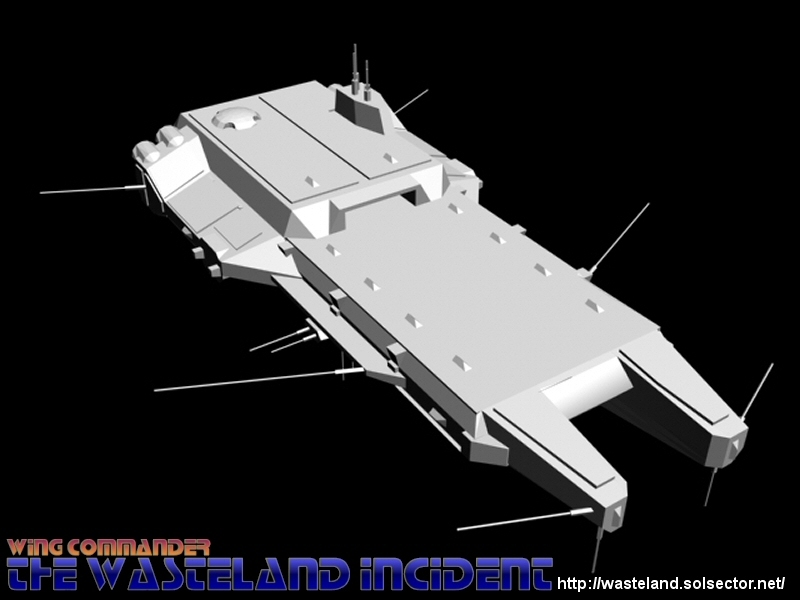 Wing Commander: The Wasteland Incident is a neat mod for Secret Ops. Matthew Kruer is quite excited about NewCommanderondaBlock's new Wasteland Vesuvius Hybrid Station Model. I'll leave it to him explain some of the recent developments. The Vesuvius Super Carrier that wasn’t meant to be. I am also still in need of highly motivated people to fill some of the open positions (Modeler / Texture Mappers, Mission Programmers (For the VegaStrike Engine http://vegastrike.sourceforge.net/), Set Designer, Character Animators) if you think you can help please contact me. Like several of the recent mods, this one looks quite promising. If you would like to contribute, you can find more here. Filler reminded us that there are some Prophecy Advance specific boards set up at some of the broad range gaming sites. These places get a lot of viewers that aren't familiar with our Crius.net that need fan support. You can reach IGN users here and GameFAQS here. 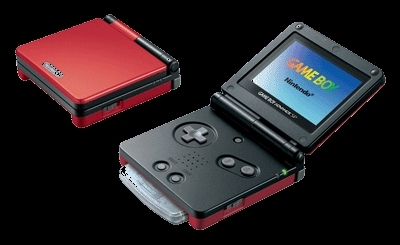 Various places are reporting about the new Gameboy Advance SP colors coming to the US this fall. Soon North American will be getting the red Flame and black Onyx colors in addition to the silver Platinum and blue Cobalt (or Cobalt Blue.. get it?). Europe already has Platinum, Cobalt and Onyx, and Japan has additional limited supply white Pearl and orange Torchick editions. Apparently North American SP sales have topped 1.1 million units in ten weeks. So do I want a Flame SP for Prophecy or should I just wait until Nintendo's next magical device (after the Cube Player I mean)? Want to speak up on an issue that really matters? Naturally, I'm talking about the quality of Wing Commander Prophecy Advance! Lend the game a helping hand by saying a few words at one of the many stores or review sites that allow individuals to comment. Chief among them: Amazon.com, GameRankings, GameSpot and EBGames. Is ace in Your Soul? We're a third of the way through ace's Happy Month and so far the biggest submission for AHM is Ghost's AHM Song. Are you going to let him beat you? Eric Watkins noticed that IGN has published their Prophecy Advance review. I've been anxious to see how they'd actually rate the game since they were the ones to initially give it the Technological Excellence award. Their article is part of the IGN subscription service, so we'll just summarize it a bit. Overall they believe the hardware limited the presentation of the game, giving it a mere 5 and 6 out of 10 rating for Presentation and Sound. They criticize the text driven story and lack of variation, though personally I'm enthralled with the Midway rooms and inflight speech. Graphics received an 8 while GamePlay and Lasting Appeal received 7's. Their overall rating was a 7. I think this is a pretty fair review, and if you think like me in terms of presentation, it'd be a bit higher. Even if you're not an IGN subscriber, you can read the first part of the article here. I wanted to remind everyone that today marks exactly two months until the CIC's Fifth Birthday. If you missed our previous mention, this will be our biggest event yet. Save the evening of Sunday August 10 on your calendars. We'll have cool prizes, special guests and exciting new things to show you. As usual, the event will be held in the irc channel #Wingnut. Here's an odd one -- TC points out that XINE, a free Linux media player, supports Wing Commander III video files. Not only that, but they list said capability as one of their features. So... if you've ever needed to watch Wing Commander III cutscenes in Linux, you're all set (in all fairness, they've got ports for other systems, too!). 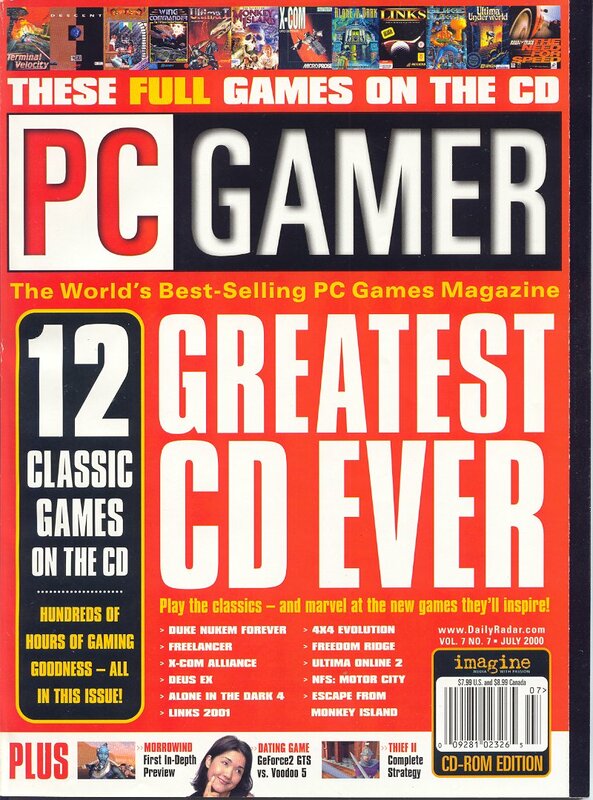 Do you have the July 2000 issue of PC Gamer? It was one of the greatest issues of any magazine for WC stuff since not only did it have an interview with Chris Roberts, it also included the full version of Kilrathi Saga's WC1 on the cover disk! Thanks to WildWeasel, we can now offer you scans of the WC articles in that issue. Originally, I was trying to come up with a name for the aliens mankind was going to be fighting in my new space game, Squadron (which became Wing Commander). Finally, after a long night at work I gave up, putting a placeholder in. It was created because I saw these aliens as killing with wrath... Kill... Wrath... Kilrath... I tacked on a "i", wrote down Kilrathi and decided it would do until I came up with a real name. 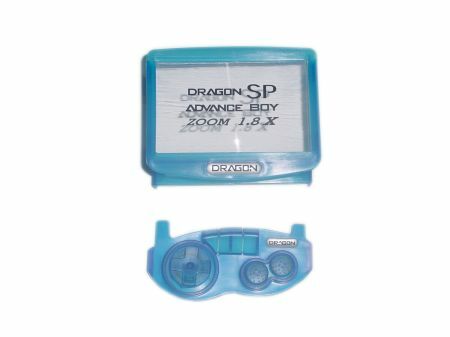 If you have a regular original GameBoy Advance, this gadget is just for you. Lik-Sang is offering this for sale. 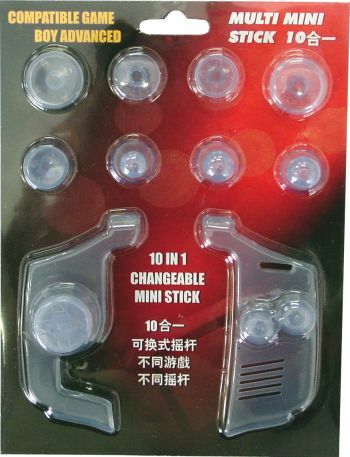 It's a neat little cover with a build in mini-stick, light, and bigger grips for making it easier to hold. For only $9, you can't go wrong. Thanks to TyeDyeBoy for spotting this. You can see some other designs in our archive here. 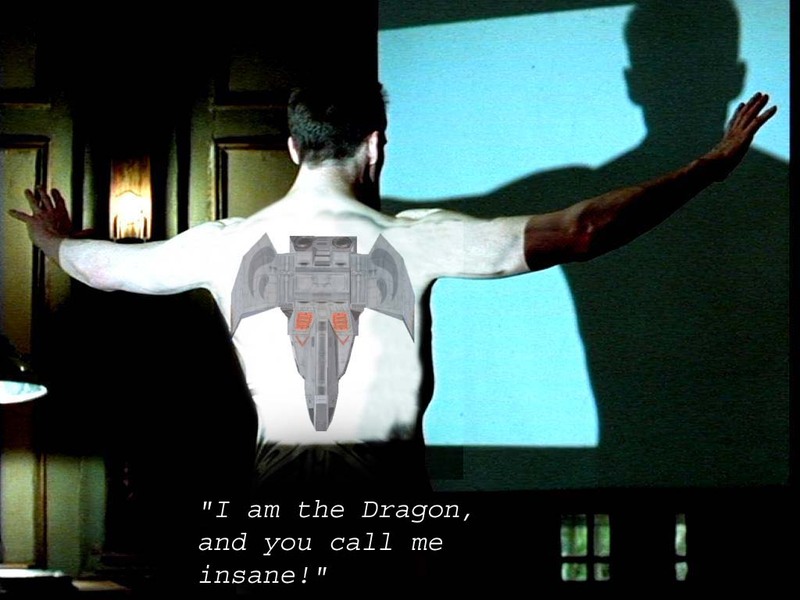 Apparently inspired while watching the movie Red Dragon, HoTT decided to make this little picture. Let's hope that he never watches.. well.. anything ever again. Bring Out Your End Runs! Wing Commander novel author William Forstchen and former Speaker of the House Newt Gingrich have co-written a new book: Gettysburg: A Novel of the Civil War... and now they're on a signing tour! According to a post at his official site, Dr. Forstchen will be signing books at a number of bookstores across the country over the course of the next month. You can find a list of locations here. There are two in the Washington DC area later this week -- I'm planning on going to at least one of them, if any other local Wing Commander fans want to meet up! HTL continues with the fourth and final chapter to Scraps Of Honour 12, "Pride Goes Before A Fall." As you saw in the last chapter, a group of the reserve pilots had engaged in a simulated duel in a planetary atmosphere. A lot more than pride is at stake, as the reserves will shortly be taking on the Nephilim forces that are sure to be following the retreating fleet, and the lessons learned in the duel may soon have to be applied for real. This chapter picks up from there, and is written by Nick "Chaeronea" Deane. Please send any and all comments to him at chaeronea@bigpond.com, not to me. So, you think you know Wing Commander 3 guides? You've got the official guide, the authorized combat guide... you've even got that awful Prima guide that looks like it was photocopied from something. 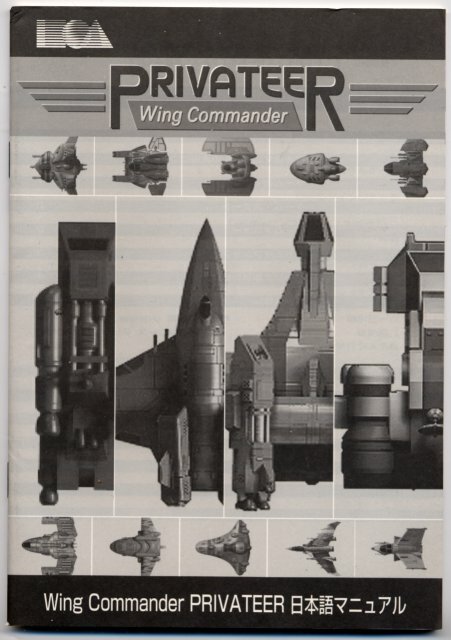 But have you ever seen... a Playstation Wing Commander 3 Official Guide? That's right -- Japan strikes again! Their country may be full of crazy robots, godzilla and scantily clad schoolgirls... but they sure know how to produce a hint book. 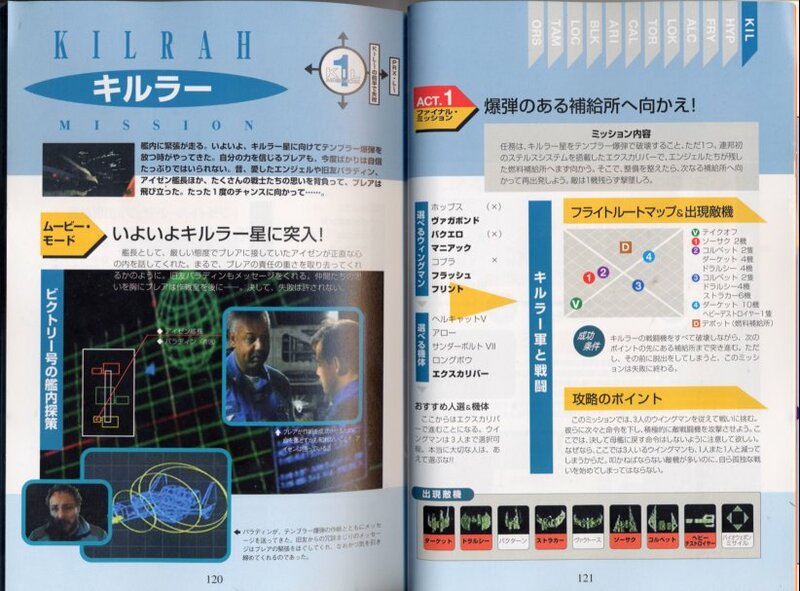 The book is 128 pages of full color graphics, showing off the weapons, characters and missions of Wing Commander 3 PSX. The ISBN is 4-7952-7646-3, if you'd like to try and find a copy. By now people have spotted that Prophecy GBA has subtle differences from the PC version, but #WingNut regular WildWeasel has spotted one of the stranger ones. In Prophecy PC, the first G'wriss mission has you assisting a convoy heading for the Taliban colony. Now, in the days since Afghanistan got turned into a crater and the Taliban regime got kicked out, Raylight decided to turn the Taliban Colony in to.. the Eielitian colony! Remember folks, the terrorists never win. Canadians Out in the Cold? We've had quite a few questions about whether or not Prophecy Advance will make a debut soon in the territory of our northern neighbor. While it does seem to be slated for Europe and Australia for later this month, Canadian retailers seem to have zero information on the title as of yet. That's not necessarily bad, as US retailers such as GameStop didn't list it until a week before shipping. Unfortunately we're still looking for any evidence for a Canadian launch. We've got all our TCs out searching for more info. In related news GameSpot is reporting that Nintendo is cracking down on imports. The full story is at Ferrago. Nintendo is reportedly having cease and desist orders issued to such retailers, and it has announced that any retailer that is found selling imported hardware or software will no longer be able to officially sell Nintendo products. I suppose if it becomes absolutely necessary, the CIC can risk losing its ability to officially sell Nintendo products in order to get some copies of the game to fans..
Dare I say this is part 1? I apparently asked "What do they call those little padded rooms for mental patients? 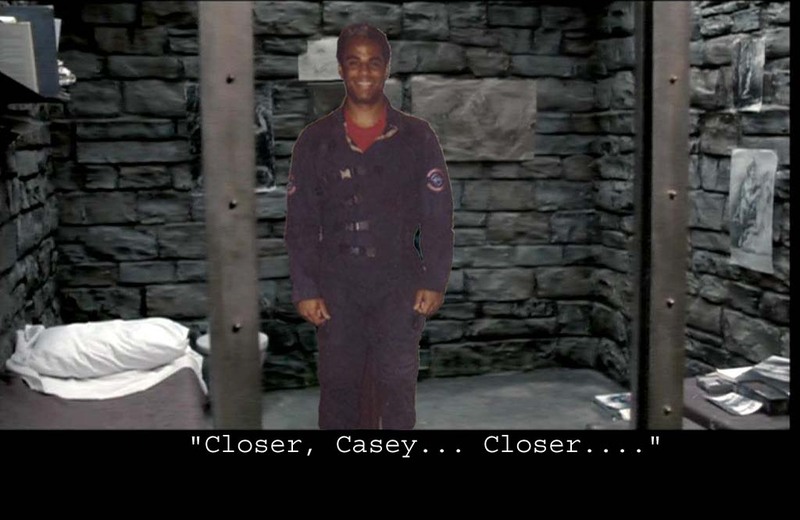 Apparently there's one aboard the TCS Midway and Zero gets to stay in it." And this came in response. Moving on..
Yeah, this one's by HoTT. 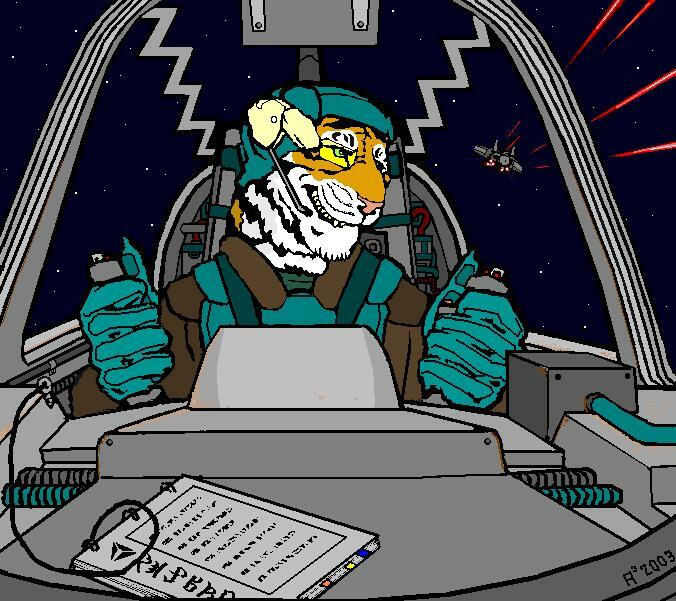 Happy birthday to Confed Stellar Cartographer/Midway Pilot Captain Johnny Guentzel -- the man who made large confusing maps the coolest thing 1997 had to offer. If you're not familiar with the Captain, you can read his Star Wars Galaxy team introduction here (see, I was leading to something). Figure out how old he is on your own -- using the following fact: written in d/m/yy format, he has the coolest birthday humanly possible. And what better birthday present than a load of money? 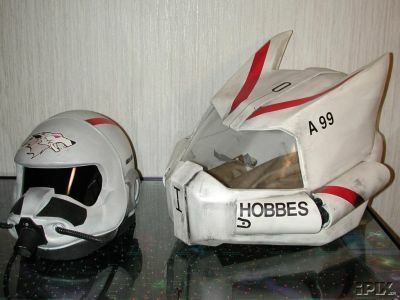 Go bid on his eBay helmets, if you're fantastically wealthy. Yup -- Electronic Arts has finally released delicious Privateer Blue! The same classic gameplay, with a delicious berry twist! 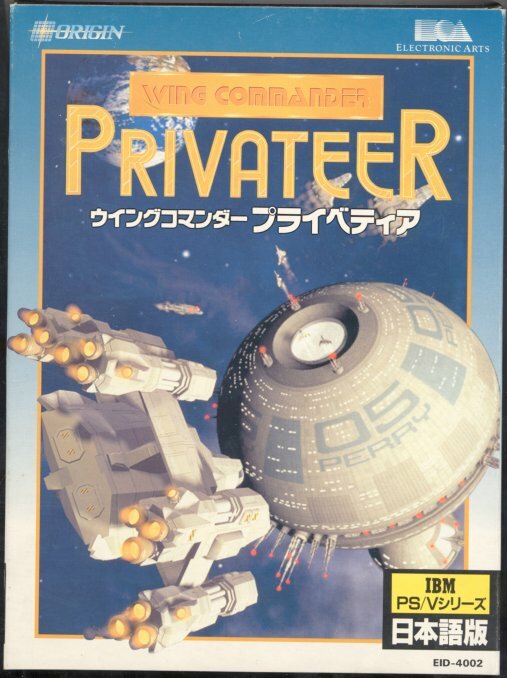 Actually, this is the Japanese disk version of the original Privateer. It's blue because... well, Japan is weird. From left to right, the box cover, the back of the box and the manual cover. It's part of my personal collection (housed in stately Lesnick Manor). 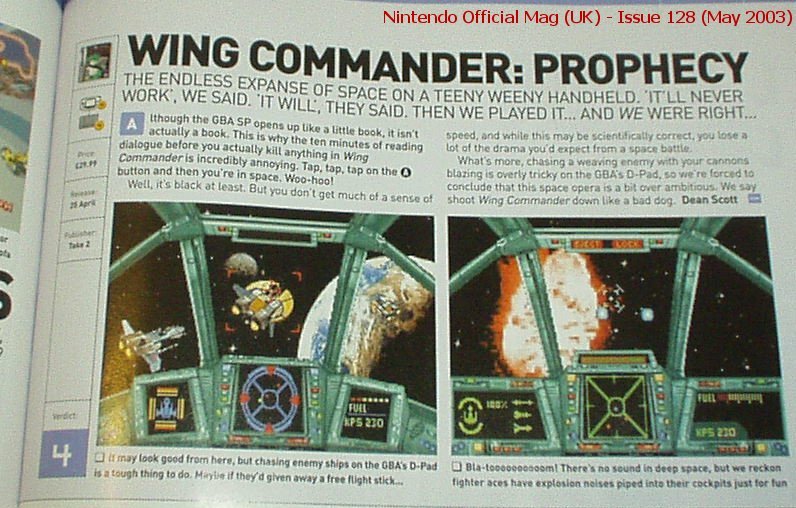 There seems to have developed a bit of an uproar over the bashing of Prophecy Advance in the May 2003 issue of the Nintendo Official Mag (UK). One of the common issues seems to stem from the publication of Star Giants photos instead of actual Blue Roses Prophecy screenshots. Due to popular demand, we've dug up their email address: nintendoletters@emap.com. Try to keep the comments polite. Although probably not as important as contacting them directly, TC also dug up a review site for the mag here. The mag gets about a 40% recommendation from reader reviews. Improve Your WCP and Scare Your Friends! 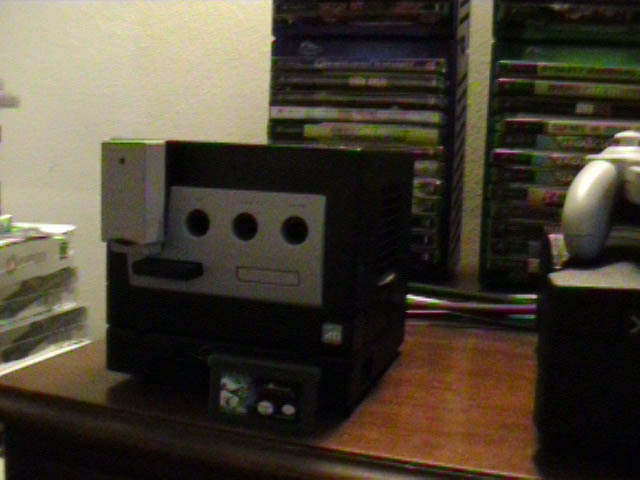 So you're waiting for the GameCube GBA Player to come out so you can buy a Cube Joystick. Can't wait? Don't have the cash? Time to improvise! 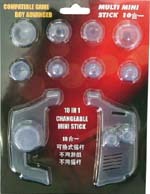 A variety of import shops such as Lik-Sang are offering small GBA and GBA SP mods to improve your tactile ability. 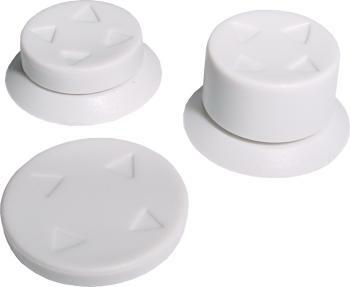 The first item we've dug up is an improved directional pad and button set for your GBA SP. This is also available in multiple colors. 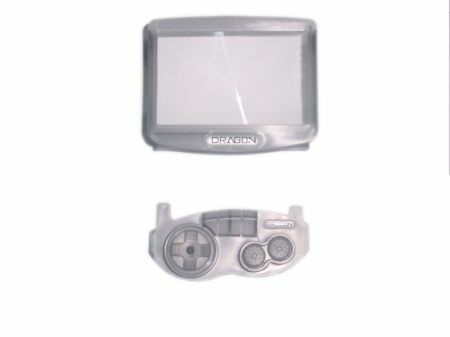 These $7.99 addons also come with an optional magnifier for your screen. For your regular GBA, there are two kinds of similar addons available here and here. They're a little cheaper. You generally get what you pay for, but none of these items bust the bank. I'll be picking up some for the Birthday Party, so I'll let you know how they feel. I'd have liked to see one of the characters in Prophecy actually try to sit inside the white egg simulator thing. As members of the Wing Commander community we strive not to sacrifice our integrity by dedicating ourselves to publishing correct and truthful news. Sadly, some print magazines don't share the same values as the official Nintendo UK magazine demonstrated this month when reviewing Prophecy GBA. Just the fact that they published screenshots from a different game should leave you wondering if they actually played the game before writing that review. Thanks to Raylight we have a scan of the review. In case I haven't yet made my point, anything you read on this scan should be taken with a pinch of salt. Prophecy GBA has started getting mentions in magazines, and while we'll try to get copies of as many as we can, please let us know if you spot one that we haven't covered yet. First up is Edge magazine's preview which does a great job of saying.. well, not a lot really. At least the screenshots are from the right game, even if they are from an older version with an incomplete HUD. Thanks to Raylight for the scan. Zero tries not to look at the yellow gunk that seems to be eating away at the Midway. What the heck is that stuff anyway? Helm-Et? I Just Met It! 1 - Well, that's not actually true. The WCP helmets have black plastic inserts, preventing you from seeing out... which, mathematically, would make Prophecy Advance only .42 times as fun. Prophecy controls got you down? 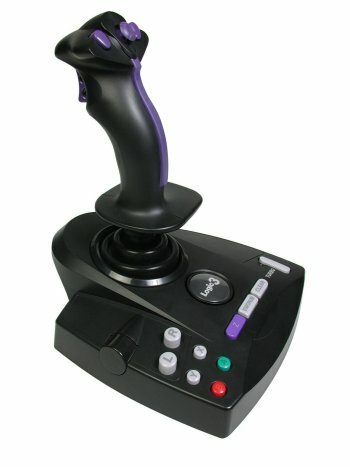 Well, here's an idea... a company called Logic 3 is producing a GameCube Flight Stick (pictured below). Coupled this with the upcoming GameCube 'GameBoy Player', which allows you to play GBA titles on a 'cube, you should theoretically be able to play Prophecy with a real live joystick! 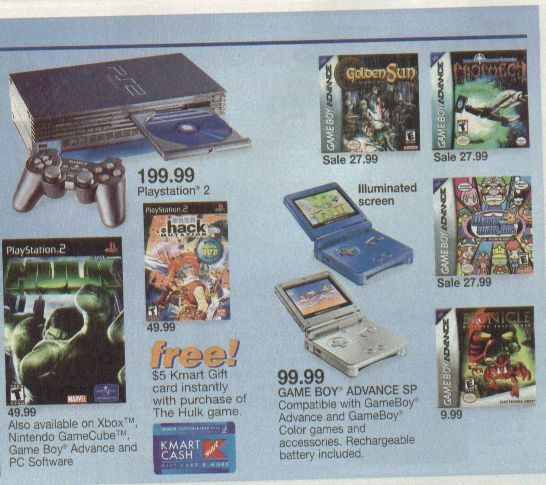 Sean Marsala was kind enough to scan a copy of the K-Mart circular featuring Wing Commander Prophecy ($27.99)! Furthermore, Warlord and jorj report that K-Marts around the US should have Prophecy cartridges in stock! So... get marting, people! I would like to confirm that. I purchased it at KMart here in Huron, South Dakota Sunday for 27.99. And I would like to say the obvious in that it is INCREDIBLY impressive! A talented makeup artist carefully applies that weird gray stripe to Zero's head. Still not convinced that Wing Commander Prophecy Advance isn't the greatest thing since sliced bread? Well, then, check out a video of the game's introduction here (10 mb)! It's guaranteed to amaze anyone even remotely familiar with the GameBoy's technical limitations. It's another divx encoded file. The Demo Man at alt.games.wing-commander has noticed that Sunday's circular newspaper advertisement for K-Mart is listing Prophecy Advance. Apparently it's for sale at $27.99 right now. If they actually have it in stock, I'd be surprised they received it before EB (though GameStops received them Friday). If anyone has a scan of the ad that'd be great. What do they call those little padded rooms for mental patients? Apparently there's one aboard the TCS Midway and Zero gets to stay in it. After taking a break from some late night CIC work, I've finally been able to really sit down and really play the game. Before even starting, some of the extras are rather nice. The game has an interesting screen for teaching you game controls and four independent characters can make a save game and play at their own pace. If I'm not mistaken, it forces capitalization in a certain way for your callsigns which is a bit odd, but very minor. The engine rendered movie clips are well done and lead into walking around the Midway well. As I said in my E3 impressions, the atmosphere of the shipboard scenes is absolutely incredible. The Killboard has had minor characters removed while the tech database has been expanded. I think they might have switched which hotspot on the wall links to each. 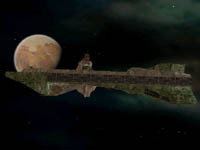 The story is presented well through the talking heads style used in other GBA games such as Zone of the Enders: Fist of Mars. Having played the original Prophecy so much, I find myself moving through the text pretty quickly. 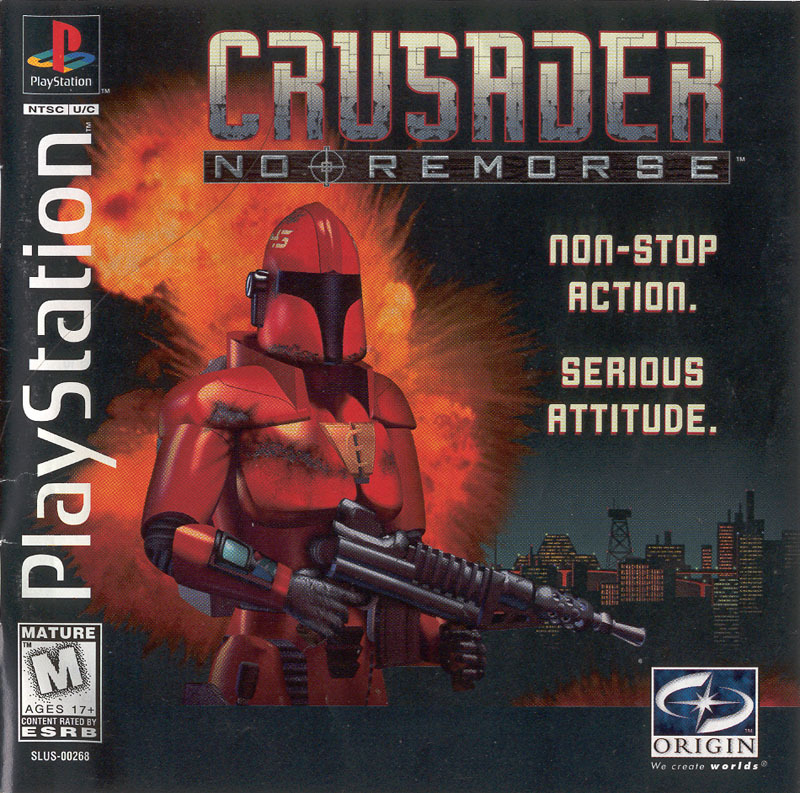 I'd be interested in hearing story impressions from people who never played the PC version. As soon as you pop into the cockpit, as other people have stated, I was startled by Comm Officer Anderson's speech clearing me for takeoff. This continues into battle where you're automatically more empathic with characters that scream "Aaghh.. goodbye friends.." (and multiple alternate lines) when they die. It's amazing how little touches like speech make you identify with them so much more quickly. 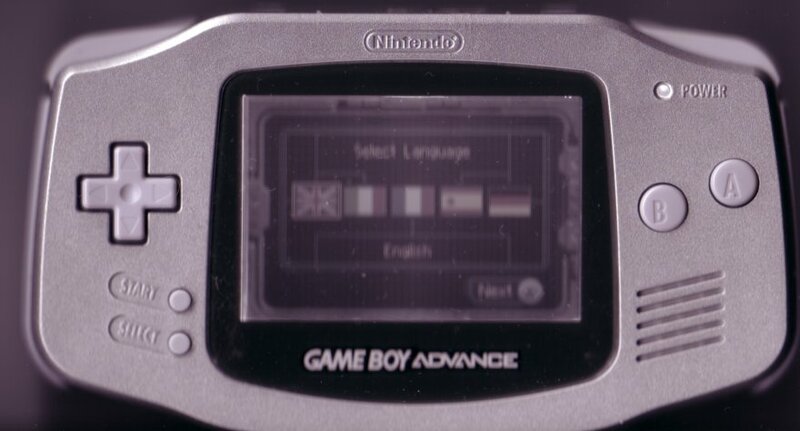 Of course control is slightly awkward because of the GBA interface. 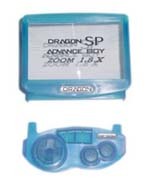 A joystick would be nice, and I will seriously be looking into the joystick clip on mods for the GBA soon. Overall the commands have been mapped to the buttons very well with much automation. About the only thing I miss is the option for full guns. Special weapons such as the stormfire and charging mass driver seem much more useful in this version of the game. Because they've taken out component damage on capital ships, the Midway is a little more susceptible to damage from your medium and light fighters, though to counteract this it seems like your Red Manta and Skate-T threats have been diminished. I think all Mantas might be the red bomber variant (at least in coloring). Mission percentages, kills and so on are now accessible during the mission when the game is paused, and your overall mission scores seem a little more forgiving. Although automating controls like Autopilot makes the game much more user friendly, it would be nice to be able to leisurely cruise around the Midway once in a while. It appears that the Wasp's boost function has been handled automatically as well. I'm looking forward to some more serious capship engagements in the future. So I'm in G'Wriss trying to save the supply convoy now. No doubt I'll have more to say as I progress. I'm really anxious to see how the controls play using a GameCube Controller when the Cube-GBA Player comes out in a few weeks. It all takes some getting used to because some of the more complex features have been dropped or modified. However there are enough surprising handheld innovations to impress most people. A whole lot of people have wondered how the complicated Wing Commander control scheme would be mapped to the Game Boy Advance. To help the curious, we've added the game to our Game Control Section. You can find out exactly how they did it here. The game also has an extremely cool ICIS style control tutor built in. Pressing different button combinations illustrates different interface commands. It's a nice touch. Quarto has discovered that local Australian Electronic Boutique stores are now listing Prophecy Advance. This is good news since we've received precious little information on launches outside of the United States and Europe. The ETA on this stands at about three weeks (same as Europe). We're proud to announce that the world famous ace Hyphen One is officially celebrating the 7th annual ace's Happy Month. June 2003 marks the seventh year since ace's Happy Homepage was created. In addition to the vast array of entertaining things there at all times, ace has constructed a special AHM 2003 site to compile new and old special submissions. A lot of older stuff has seemingly been lost to time, but the powers that be are currently in the process of digging things back up. Stay tuned throughout the month for new AHM events and the discovery of long lost AHH artifacts. You still have time to contribute yourself as well. Although .wav audio is the traditional sound format of AHM, mp3s and other exotic media formats are welcome as well. You're not a real character if there's no picture of you sitting in the briefing room with a name penciled in.